What happens when you decide to retell the classic fairy tale Snow White as a comedy? 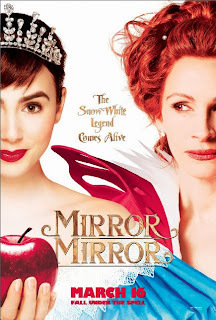 You get the latest film from Brett Ratner, Mirror Mirror. The Film stars Julia Roberts as the Wicked Queen, Nathan Lane as the Queen's most loyal servant Brighton, Lily Collins as Snow White, and Armie Hammer as the Prince of Valencia, whom you probably recognize as the Winklevoss twins from The Social Network. So here's what you know, Snow White is the fairest, the Queen is evil and vain, she has her mirror, the King is gone and there are dwarves and a Prince. After that this is not the Snow White we all have read seen or told our children. The Queen makes a play to marry the Prince, the mirror is a very interesting concept in this film, its an alternate room that she walks thru the mirror to reach and so she talks to her reflection. The dwarves are awesome. gone are the nameless ones from the Brothers Grimm and the ones we all know from Disney, instead we have Half-Pint, Chuckles, Wolf, Butcher, Grub, Grimm and Napoleon. Snow White is no wilting flower waiting for her prince, cleaning up after the dwarves; she's strong, determined and does it all in a corset and palazzo pants. The movie is a straight up comedy, lots of inside jokes, slapstick and the Queen is quite sarcastic. She even opens the movie telling the tale of Snow White which she even decrees to be a very pretentious name for a child and you can't help but to laugh. I really enjoyed this treatment of the dwarves. Choosing to give them completely different names and personalities than what we know as well has making them a large part of the film really worked for me. I'm giving this movie a Matinee. Go alone, take the kids go on a date, its really comedy more than it is a family movie. There's nothing overly scary or violent, just a rather gross scene with bugs and other creepy crawlies that even i had to turn away from. Mirror Mirror opens today in theaters across the country. It is rated PG. The movie clocks in around 1:40 so the kids will be entertained but i don't think you need to bring them along.